"Always and Forever" is an R&B song written by Rod Temperton and produced by Barry Blue. It was first recorded by the British-based multinational funk-disco band Heatwave in 1976. Released as a single on December 3, 1977, the song is included on Heatwave's debut album Too Hot to Handle (1976) and has been covered by numerous artists, becoming something of a standard. The song reached number 18 on the US Billboard Hot 100 in March 1978 after peaking at number two on the US Billboard R&B chart, the band's highest showing on that tally. The single was certified platinum by the RIAA on September 6, 2001. In the UK, the songs "Too Hot to Handle" and "The Groove Line" were released before a double A-sided "Always and Forever" / "Mind Blowing Decisions" was issued in November 1978. This became the band's second top ten on the UK Singles Chart when it spent two weeks at number 9 in December of that year. After the international success of Heatwave's debut single, the disco song "Boogie Nights", "Always and Forever" was chosen as the U.S. follow-up single in late 1977. A ballad featuring lead vocals by Johnnie Wilder, Jr., "Always and Forever" stood out among the band's predominantly disco repertoire and became a successful U.S. hit song in early 1978. In the late 1970s through the 1980s it was a popular "slow dance" song at high school proms, weddings, particularly in inner-city areas with a high minority population. The song was also played during the slow dance scene in the movie House Party. In the liner notes to Heatwave's 1996 compilation album The Best of Heatwave: Always and Forever, music writer and former Billboard contributor Brian Chin notes that Wilder "says that it was right around the time of the single release of "Always and Forever" that he knew Heatwave's music would stand the test of time. This pop standard is emblematic of the Heatwave fusion of influences - R&B, teen romance, and both European and American flavors of pop." AllMusic reviewer Craig Lytle states that the song "was and continues to be an ageless piece. Johnnie Wilder's vocal exhibition throughout the vamp is breathtaking." (1994) "Love the One You're With/Going in Circles"
R&B/soul singer Luther Vandross released his cover of "Always and Forever" as the second single from his album, Songs (1994). His recording earned him a Grammy Award nomination in the category Best Male R&B Vocal performance at the Grammy Awards of 1995 and placed on four Billboard charts, with its best showing on the R&B chart where it reached number 16. Vandross' single made the Hot 100 at #58 and also appeared on Billboard adult contemporary and rhythmic top 40 charts. Among many artists who have recorded versions of "Always and Forever" is the American R&B vocal group Whistle, who released their single in 1990 from their album of the same name. Their take on the song made the top ten on the Billboard R&B chart, peaking at #9, while also cracking the top of the Hot 100 at #35. Mexican-American singer Adán Sánchez also recorded a version in Spanish titled "Siempre y para siempre". ^ Whitburn, Joel (2010). The Billboard Book of Top 40 Hits, 9th Edition (Billboard Publications), page 293. 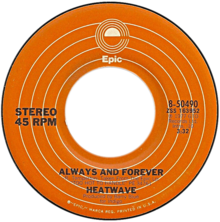 ^ Liner notes from The Best of Heatwave: Always and Forever, 1996, Sony Music Entertainment. ^ Too Hot to Handle album review AllMusic. Retrieved 12 August 2009. ^ "The Irish Charts – Search Results – Always and Forever". Irish Singles Chart. Retrieved July 14, 2017. ^ "Heatwave - Always and Forever". UK Singles Chart. UK Official Charts Company. November 4, 1978. Retrieved September 25, 2018. ^ a b Heatwave Billboard chart info AllMusic.com. Retrieved 10 August 2009. ^ Whitburn, Joel (1993). Top Adult Contemporary: 1961–1993. Record Research. p. 108. ^ "Top 100 Hits of 1978/Top 100 Songs of 1978". Musicoutfitters.com. Retrieved 2016-10-05. ^ Vandross Billboard chart info AllMusic.com. Retrieved 10 August 2009. ^ "Luther Vandross - Always And Forever at Discogs". Discogs.com. Retrieved 2016-10-05. ^ "Luther Vandross - Chart history". Billboard. Retrieved 2016-10-05. ^ "Chart archive : Luther Vandross". Archive.today. Archived from the original on 2013-01-19. Retrieved 2016-10-05. ^ "Music: Top 100 - Billboard Hot 100 Chart". Billboard. ^ "Rhythmic - Billboard". Billboard. ^ "Hot R&B Singles - Billboard". Billboard. ^ "Adult Contemporary Music Chart - Billboard". Billboard. ^ Whistle Billboard chart info AllMusic.com. Retrieved 10 August 2009. "How Many Times Can We Say Goodbye"
"Til My Baby Comes Home"
"There's Nothing Better Than Love"
This page was last edited on 15 April 2019, at 08:47 (UTC).